Posted by Kaitlyn Egan on 9:07 AM on July 23, 2014 . Mary Atkins is dedicated. You can find her between the aisles four days a week at the Twin Cities Habitat for Humanity ReStore, organizing the merchandise and helping customers find exactly what they’re looking for. She never misses an opportunity to share a smile along with the latest sales on hot items with visitors. 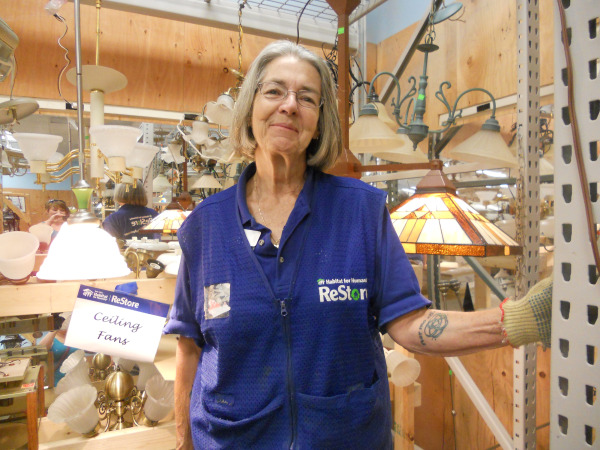 Mary came to the ReStore at the end of April, but her ReStore experience goes back two years. The Minnesota native lived in Wisconsin for a time, where she volunteered four days a week at the ReStore in Appleton. When it was time to move back to Minnesota, Mary wasn’t ready to hang up her ReStore vest just yet. Staff at the Wisconsin ReStore encouraged her to keep up the good work, recommending she connect with ReStore staff in New Brighton. “The ReStore is filled with dynamite people dedicated to this cause,” Mary said. Mary, a retired office worker and daycare provider, said she developed plenty of organizational skills over the years and still wants to put them to good use. Since starting her work at our ReStore in April, Mary has been invaluable. There are 26 Habitat for Humanity ReStores in Wisconsin, and 12 in Minnesota. Each ReStore is different, Mary said, but there are a few differences that she’s noticed between the Appleton and New Brighton ReStores. The main difference is the Appleton ReStore is blessed with a large group of senior volunteers who regularly staff that store day-to-day, she said. Mary attributes that, in part, to the store’s longer history in the community. People are very familiar with the ReStore. The New Brighton ReStore is still gathering regular volunteers, and Mary hopes she can share some ideas to connect with even more potential volunteers. She said there are plenty of folks out there, retirees like herself, that would love volunteering at the ReStore. It’s just a matter of how to reach them. “I am very excited about working here because I think I can not only contribute to the workforce but also contribute some good ideas,” said Mary. 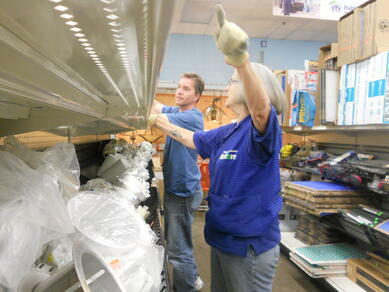 For her, volunteering at the ReStore is all about giving back to the community. The work may be tough sometimes, but Mary always has a smile on her face. It’s important to make visitors feel welcome, she said, so they not only come back but tell others to visit the ReStore as well. “I take pride in my workmanship here,” she said. In only a few short months, Mary has already made a lasting impact at the ReStore.